Why Did an Upstate New York Town Join the Confederacy? Readers of The Immigrants’ Civil War know that German immigrants in the North were outspoken opponents of slavery and were extremely active in recruiting German regiments for the Union. But there were Germans who opposed the war, and the story of Town Line, New York, is the most extreme. 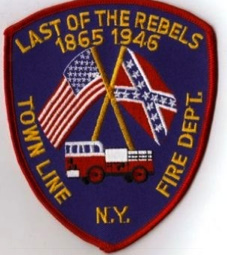 Town Line’s fire department badge recalls its Confederate history. Town Line is a small farming hamlet in between Buffalo and Rochester. Back in 1861, it was dominated by recently arrived German Lutherans and settlers from Vermont. In other parts of the country during that period, German immigrants would have opposed slavery and voted accordingly, but in Town Line, the Germans, frightened by local Know Nothings, joined the Democratic Party and opposed Lincoln’s election. Many of them had left Germany to escape army conscription and they were afraid they would soon be drafted into Lincoln’s army. When war was declared, [the town] seethed with the news, and many were the nights we stayed up as late as 12 o’clock to talk things out. The first war meeting was held on the evening of April 23d at the American Hotel and was addressed by Dr. Hunt and Almon Clapp from Buffalo. I was twelve years old at the time, but I remember the stern faces of the elders and the storm of passionate and angry discussion. Soon the town split into two factions, it was a very tense situation. George Bruce held court on the steps of the building where he and his son were closing up the affairs of the Merchants Bank and was the center of a group of rabid Southern sympathizers and avowed democrats. He made no pretense of concealing his sympathy for the South. Thurston Carpenter, an argumentative invalid sitting in his wheel chair at his store on the opposite side of the road, was a red-hot Republican, and the leader of the other faction. Bruce and Carpenter clashed daily. These men formed, as it were, two hostile camps, between which occasionally there would be a parley, but more often a bitter verbal war. As you went out of an evening for a walk after dinner—and everybody walked after dinner in those days—you could see the partisans of both groups dividing on the street as naturally as oil and water divide. And often the excitement ran so high that if a man in either group had made the slightest sign, neighbors would have been at each others throats and fists would have taken the place of words. The men in the community voted to secede from the Union by 80 votes to 45. As far as I know, it was the only village in the northeast to “leave the Union.” Tradition holds that 20 men from Town Line served in the Union army and 5 joined the Confederates. The story gets even odder. Town Line never formally renounced secession when the war ended. In 1945, locals wrote to President Harry Truman to ask how they could rejoin the Union. Truman took time out from reconstructing Europe and Asia and containing the Soviets to write back suggesting they roast a veal and vote on it. Town Line roasted beef instead, renamed their downtown Truman Plaza, and voted 90 to 23 to rejoin the United States. Actor Cesar Romero counted the votes that ended their place as the last Confederates.